The Villa Bougambilla with Heated Pool is a fully equipped holiday home which is located on a private development (called Bahiazul). The villa comes complete with full air conditioning and a fully fitted kitchen including a washing machine, television, DVD player, free Wi-Fi, and private parking. On the roof terrace there is a pergola with table and chairs. There is also a wonderful jacuzzi and loungers on the roof terrace. Guests at the villa can also benefit from the on site facilities which include the Bikiny Bar, Restaurant and private SPA. The villa is in a peaceful part of Corralejo, yet only 5 minutes by car from town and the wonderful natural park of the Dunes. A nice a tricky par 3 golf course is only 150 meters from the villa. I could recommend it to you to improve your short game and putting. The pool is heated from 1st November until 31st of May every year. The water has a temperature of aprox. 26ºc. The outdoor jacuzzi is heated all year round to a temperature of aprox. 26ºc. The size of the pool is approx. 6 x 4 meters. The water in the jacuzzi is heated. The temperature of the water is aprox. 25ºc. This facility is available from 1st November until end of May every year. Towels and linen provided for the arrival (without any charge). The villa is cleaned completely every 4 days (including the fresh towels and linen). Extra pool and interior cleaning (including fresh towels and linen) are available. Please ask my staff. Our family have holidayed in Corallejo for the past 3 yrs and this is the first time we have stayed in a villa. There was five adults, 3 aged twenty, and we had the best holiday you could ever wish for. The villa was outstanding, pool, jacuzzi, air-con, piped music via intercom, not one thing we could complain about. Also, each room has its own shower so no queing to get showered and ready for a night out. There is a 24hr shop about 5mins walk at the first rundabout, 2 roundabouts later ther is several bars etc for breakfasts/meals, Caspers cockyail bar is a great place for a cocktail or nightcap. In town, we recommend Waikiki for food and its bar/club for late drink in pleasant surroundings. also Golden Days bar in town for music quiz etc great hosts in Alan,Debs and Wally. Finaly, we must thank a few people, Cesar who was most helpful throughout and made booking so easy, and a special thanks to the Bahiazul staff, Pascal and Sven they are a credit to the complex and could not do enough for us, fantastic guys. Overall, we enjoyed our stay here very much. A lovely bright, attractive and very private place. We didn't have any hot water for the night we arrived and the following day due to a plumbing job being left unfinished. After the water was turned back on, there was a leak and the bathroom and main bedroom were flooded with water pouring through the light fittings. We wanted a villa that had Wi-fi and although this had it, the only place it was useable was on the roof terrace which was very inconvenient. The signal was very weak so there was no chance of streaming any tv programmes from home and we only got a basic service. That said, the complex was very clean and quiet and the staff welcoming and accomodating. The villa was everything we had hoped for. It was spacious, clean and very well appointed. The pictures are a true representation of the villa. The complex is run by a very efficient, helpful and friendly management team, led, in our case, by Pascal. It is well worth taking time to chat with him as he has a wealth of information. He speaks several European languages. He was able to direct us to the best supermarkets, restaurants and places of interest. Any maintenance issues were dealt with expeditiously. 1. The slippery outside floor when wet. Pascal stated that this is to be addressed in the near future by applying non-slip paint. 2. The jacuzzi - it works well as a spa but is not, by our definition, a hot-tub because the water never really got hotter than tepid. 3. The additional bedrooms can only be accessed by exiting the main building making it, in my opinion, a security risk when travelling with young children; that said at no time did we encounter any rowdiness or felt the need to review our security measures. Some visitors have mentioned the distance to Corralejo. We were fortunate to have the use of a car and considered it a bonus to be so far away from the hustle and bustle of the town. This was our first visit to Fuerteventura. The temperature was warm, in the mid 20s however the wind made it feel cooler. There was the occasional rain shower. This did not stop our enjoyment of the beautiful nearby beach or touring the island. We had a lovely time and would thoroughly recommend it to anyone! This was my first holiday in the Canaries and also in a villa with a pool. We chose not to hire a car and did in fact manage fine without one. We took 3 teenagers with us aged 15 to 18. The journey to the villa from the airport was easy and cost about 45 euros. We were greeted very enthusiastically by Pascall and then had the only bad experience of the whole holiday which was a 2 and a half hour wait for our villa to be cleaned. Once we were in the villa everyone was happy with the facilities and the standard of cleaning etc. There was a small supermarket within a five minute walk of the complex, but you really needed a taxi to get into town. Only 4 or 5 euros thogh so not expensive. The restaurant on site was very good but very quiet when we went. We had a very relaxing holiday and enjoyed the fantastic weather. We booked this villa at fairly short notice with the intention of having a few days of sunshine before the winter sets in. There were a few minor faults that needed sorting out which were seen to on the day on which we reported them. The staff on site were both very friendly and extremely helpful. Both breakfast and dinner can be taken in the club restaurant which provides excellent meals at very reasonable prices. The estate is behind a barrier, manned 24/7, with security guards patrol at night. The villa pool is more of a plunge pool than a swimming pool but there are magnificent beaches within 10 minutes drive - and most of the beaches in the area are blue flagged. The only drawback we identified is that the villas are all very close together. As all seem to be equipped with outdoor music audio systems noise from neighbours can be an issue. 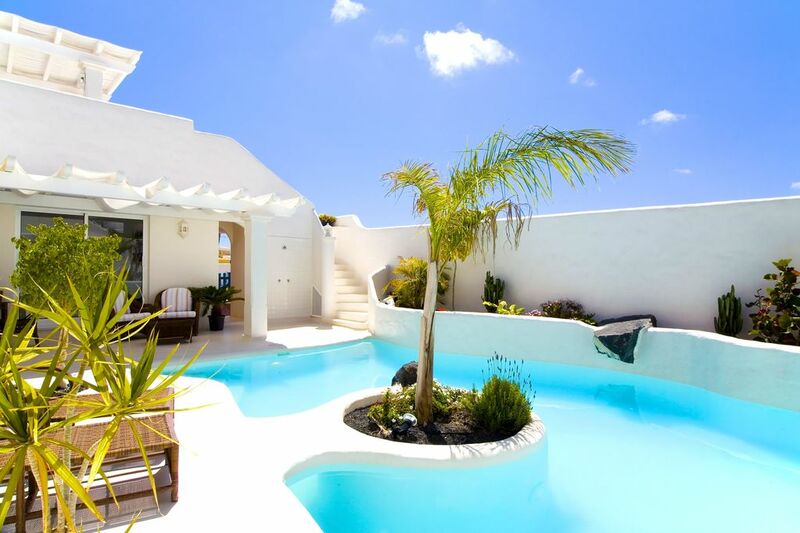 Central Corralejo is around 1.5km away or approximately 20-30 minutes walk. Other popular destinations include the lovely old town of El Cotillo which is approximately 15km away or the capital of the island, Puerto del Rosario where you can spend all day shopping without worrying about afternoon siestas interrupting your spending, at the new Rotunda shopping centre. Puerto is around 30km away or approximately 25 minutes by car. The nearest beach is Flag Beach which is around 3.5km away. (5 mins by car or 30 mins walking). This beautiful white sandy beach is popular with wind/kite surfers or those wishing to top-up their all over tans! The beach is very big and never suffers from over crowding. The beach stretches some 6 miles and is arguably one of the best on the island. There are smaller beaches around Corralejo harbour which too are excellent for swiming and sunbathing plus there are many bars available. 100 € (or 100 GPB if it is more comfortable) refundable deposit will be required on your arrival day in cash please. You can pay 100€ if you prefer. All charges are included in the price, such as the final cleaning, electricity, air conditioning or private wifi internet.